Splash into a world of fun at the Adams Mark Hotel and Conference Center Situated close to the intersection of I-70 and I-435 our hotels near Arrowhead Stadium and Kauffman Stadium and a short drive from attractions and the bustling streets of downtown Kansas City. Our family-friendly location is the ideal place for your vacation destination. Take the kids for wild adventures at Worlds of Fun or interactive exhibits at Union Station and history lovers can not miss visiting the Harry S. Truman Library and Museum or Liberty Memorial. Since our hotels guests are near Arrowhead Stadium and Kauffman Stadium its easy to catch a game after a day of fun at our indoor water park. Complimentary high-speed wireless Internet access and a Business Center with copy print and fax capabilities helps you keep up with the office while your on vacation. If you are looking for hotels in Kansas City MO with event rooms we have more than 16000 square feet of flexible space which can accommodate up to 1200 people. This Key West-themed water resort is a warm 84 degrees year-round and has five thrilling water slides large activity pools and an awesome play structure. When you stay at our hotels facility in Kansas City MO you will also enjoy features like an on-site restaurant and bar a well-equipped Fitness Center and an indoor/outdoor spa. 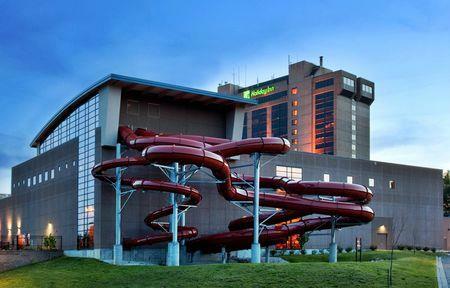 Take the plunge with us on your next trip in Missouri. Across from the Truman Sports Complex. CoCo Key Water ResortThis Key West-themed water resort is a warm 84 degrees year-round and has five thrilling water slides large activity pools and an awesome play structure. When you stay at our hotel facility in Kansas City. Independence Center Mall - Independence Events CenJust ten minutes from the Independence Center Mall and Independence Events Center. Kansas City Convention CenterJust 10 minutes from the downtown convention center. Kansas City ZooKansas City Zoo is a 202 acres zoo founded in 1909. It is located in Swope Park at 6800 Zoo Drive Kansas City Missouri in the United States. Power and Light DistrictPower and Light District houses many hip restaurants and bars and hosts music venues and nightlife year round. Sprint CenterSprint Center hosts a variety of events from sports to concerts. Worlds of Fun-ceans of FunTake the kids for wild adventures at Worlds of Fun or interactive exhibits at Union Station and history lovers can not miss visiting the Harry S. Truman Library and Museum or Liberty Memorial. Adams Mark Hotel and Conference CenterIf you are looking for hotels in Kansas City MO with event rooms we have more than 16000 square feet of flexible space which can accommodate up to 1200 people. Truman Sports Complex - Royals-ChiefsSituated close to the intersection of I-70 and I-435 our hotel near Arrowhead Stadium and Kauffman Stadium and a short drive from attractions and the bustling streets of downtown Kansas City.